A newspaper reporter interviewed me recently. 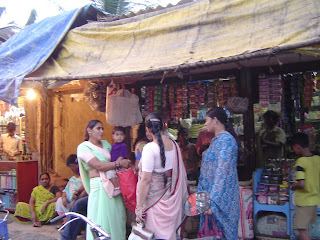 One of the questions she asked me was about the poverty in Mumbai, and our tours to Dharavi, Asia's largest slum. "Is this not voyeurism? ", she asked me. "The affluent stare at the poor, and you make money off it?" The answer to this question is complex, so I thought I'd list my views here and invite comments from you, my readers. First of all, there is no avoiding the poor in Mumbai. The slums are all-pervasive. In many parts of the city, there are shanties by the roadside. At Colaba, at Horniman Circle, there are the homeless - they are dirty and unkempt, living on the pavements. On a recent drive through Fort, a semi-naked man walked past us, his body caked with dirt, his clothing in tatters. At traffic signals, tourists are accosted by beggars with shocking sores and disfigurements. For overseas visitors, the image this creates is of two bewilderingly different Mumbais - one that is rich and glitzy and safe in their five-star cocoon, and the other that lives a hellish life on the streets, begging, cringing, with no self-respect whatsoever. 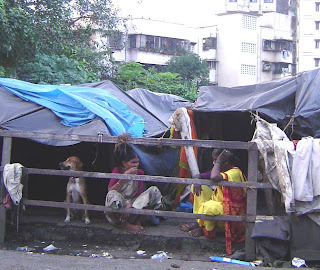 There is no room for an understanding of a third Mumbai - the Mumbai of the hard-working poor. 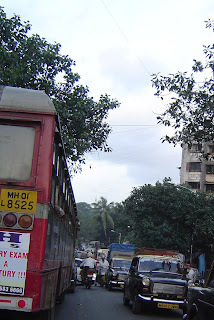 The Mumbai of the aspiring migrant, with his fierce drive for survival, for self-improvement. The Mumbai of small enterprise. The Mumbai of cottage industries. The Mumbai of poor yet strong women, running entire households on the strength of their income from making papads. Every morning, these women put food on the table, braid their daughters' hair, and send them to schools. They have hope for the future, you see? This is the Mumbai of dreams, which I want my guests to see. Dharavi is one place where this third Mumbai is visible. 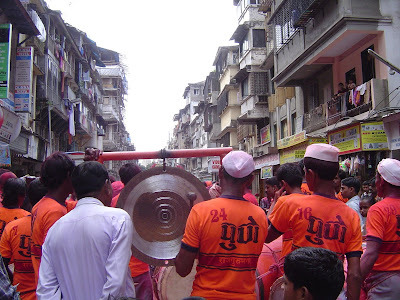 In the papad units, in the little tailoring shops, in Kumbharwada, in the kirana grain stores, everywhere Dharavi displays a spirt that is fierce and energetic. Every time my overseas visitors go into Dharavi, they come back with a first-hand insight into this third Mumbai. One of my American guests summed this up very well, after a 2 hour visit to Dharavi. I've quoted her before, and I quote her again: To me, this place dispels the myth that poverty is due to laziness — that the poor somehow deserve their lot in life because they are lazy or stupid or otherwise lacking in some important character trait that the successful possess. Dharavi is a resounding rebuttal to that belief. Seeing Dharavi is not even remotely voyeuristic. Dharavi stands up and demands respect, and guess what - it gets it. I clicked a photo of the little Ganesh idol in my kitchen, installed and decorated specially for this year's Ganesh festival. My maid was the chief decorator. The props were simple - leaves, fruits, flowers, incense, coconut - but the effect was lovely. The idol looked beautiful and serene. If you look at the photo below, you'll see the right hand is raised in abhaya-mudra, offering blessings. On the left hand, usually a modak is placed, but my maid figured an apple was a good idea. Hmm. Healthier, of course. 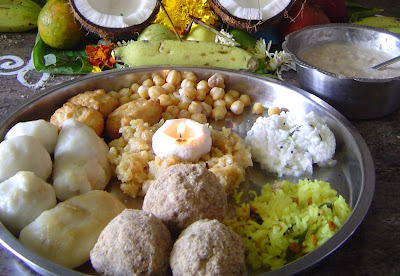 On the first day of the festival, this is what we cooked at home, as offering. My maid is from Andhra Pradesh, so she decided what to make based on what they did in her village. My mum provided the recipe for kozhakattais - steamed rice dumplings stuffed with coconut and jaggery. Once the food had been offered to the Lord, we then got on with the real business of the day - lunch! I went on a tour of the Fort district yesterday. My guest was a young American lady, a lawyer from New York. She'd just moved to Philadelphia, and she was going to start a new job at a law firm. This was a holiday - she was in-between jobs, and she was travelling alone. 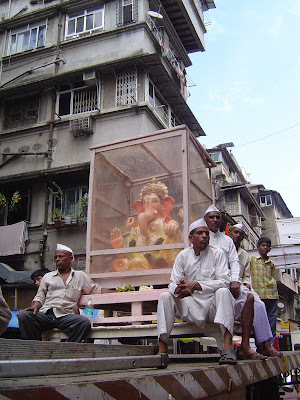 As we walked around the Fort area, we saw a Ganesh procession. 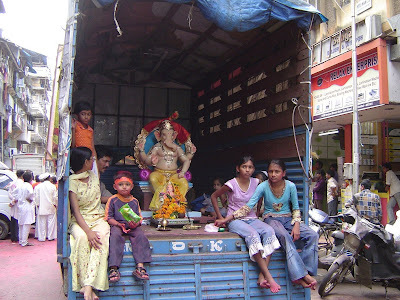 It was the first day of the Ganesh festival, when the idols are brought from shops to be installed in large 'mandaps'. 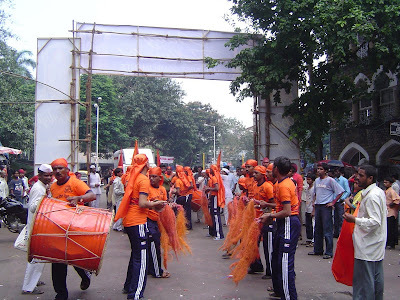 Mandaps are temporary constructions of wood and paper that house the deity during the festival. 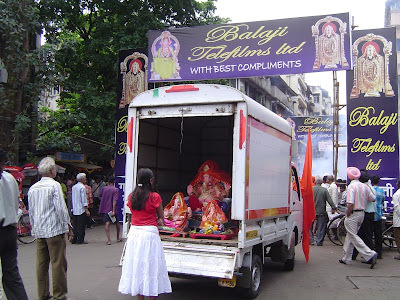 The idols are transported amidst a lot of singing and dancing. We also heard the clanging of the cymbals as the men danced in formation. As if that wasn't enough, there was this big steel-and-brass gong. They were going at it with a metal hammer. There were children on several trucks, here is one of them. Passersby stopped to admire the idols. The sky was overcast, so this large Ganesha had a temporary glass enclosure. Hmm. I should maybe call this one Phone Booth Ganesha. There was a lot of coloured powder being thrown around, but no one threw colour at us, or pestered us to join. 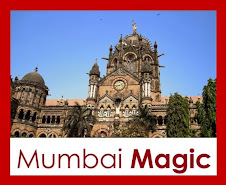 Once the processions left, we went inside Victoria Terminus to see the train station. Although it was a holiday, there were still a lot of people buying tickets, walking around, selling trinkets, and so on. No one paid us much attention...we admired the carvings, clicked several photos, and then we decided it was time for lunch. We went to Indigo, near the Taj. 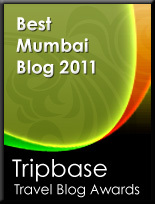 "I think Bombay's a lot like New York" said my visitor over lunch. I looked at her, surprised. 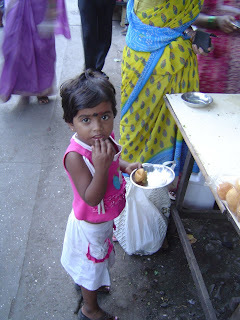 We had just seen Mumbai's biggest traditional Indian festival, and she thought it was like New York? Then she explained - "It's got the same energy. Everyone's busy doing their own thing, no one bothers you. You're sort of anonymous, but you fit right in." I thought of my last visit to New York - and the feeling of instant comfort that I had in Manhattan. Nobody gave a damn about me, everyone was busy, and the streets were vibrant with activity. I could walk anywhere, dress any which way, speak in any accent - it was all acceptable. To fit in, all I need to do was look busy. It was a very good feeling. Perhaps my visitor felt something similar in Mumbai. Towards the close of lunch, she said "You know what, Deepa? When I walk around in Mumbai I get the feeling that as long as I don't look lost or stupid, I'll be fine." I just *had* to smile. That last sentence was proof - she felt exactly the same way about Mumbai that I felt about New York. It was 5:30 p.m. 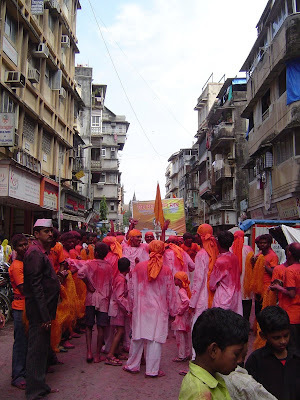 I was on my way to Koliwada Market. Walking eastwards from Koliwada Station, my eyes fell on the pavement dwellers, some squatting outside their huts, others washing and cooking, and the children sitting amidst the garbage with their schoolbooks spread around. Some of the men could be seen doing odd jobs like repairing stoves, welding, etc. To move further down, I had to push my way between trucks and vehicles and the sea of humanity walking up in the opposite direction. 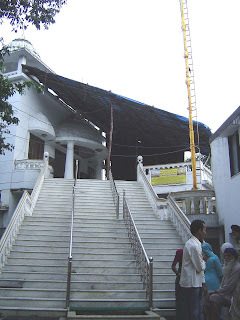 On the right, a newly painted Gurudwara in white captured my attention. Truly the Almighty does not distinguish between the rich and the poor - He is happily housed amidst the squalor. With no time to stand and pray, I moved ahead. 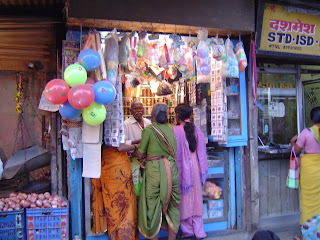 Shops selling sarees, hardware, sweetmeats, provisions etc were lined on the left. Women and children stood around, enjoying an evening chat. A bangle-seller was doing brisk business. But I wondered why people were crowding on the other side of the road. With all the skill of a born Bombayite, I crossed the crowded road. I heard the vegetable sellers sitting on the road, speaking Tamil. 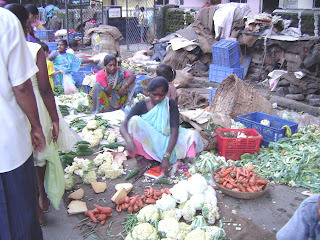 Piles of tomatoes, beans, snake gourds and other vegetables were being offered at incredibly low prices (sans quality). 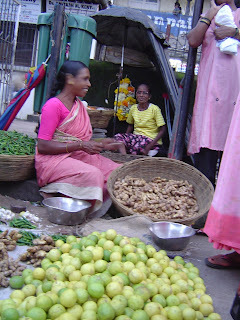 At one place I found a woman selling lemons, 25 of them for Rupees 5. What a bargain! I normally pay 2 Rupees per piece! I paid a 5-rupee coin, and bending down, gathered 25 of them to make lemon pickle. 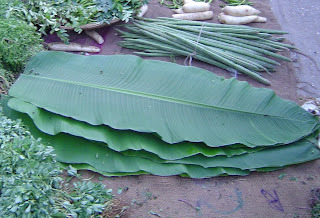 At another corner, a lady was selling plaintain leaves, to use as dinner plates. Further ahead, there were many shops selling furniture. Doors, windows, iron grille-work, chairs, tables, everything seemed to be available. Many of them seemed to be discarded pieces from nearby buildings. Here was a supermarket for second-hand stuff! I stood in amazement, watching people haggle over the price. The road back to the Station had an uphill slope. 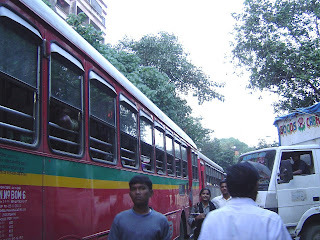 Again, I had to move along with buses, vehicles, and of course, other people like me. In thirty minutes, I reached home, but the sights and sounds of buyers and sellers, of workers and idlers, lingered in my mind. It was seven p.m., and we were at my grandmom's house for dinner. My cousin Ramya was there already. 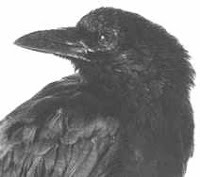 We saw a baby crow, fallen out of its nest. It was flapping its wings, trying to get off the ground. If it didn't manage to fly, it was going to be eaten by a cat the minute I went inside for dinner. It was kind of helpless, so I bugged my mom about it, and she finally decided to take it to the Bombay SPCA in Parel. When we got there, we were directed to the surgical ward. It smelled so medical. Scary. A dog with a frantically wagging tail was on an operating table, being held down by two vets. A vet checked the baby crow. He was fine, just in shock. They placed him in a large cage, and left him to sleep the rest of the night. In another cage, were 5 beautiful owls, cuddled up together for comfort. They had been rescued from a poacher recently in Powai. They were Indian Barn Owls (tyto alba). The barn owl rests during the day in dark lofts, shaded corners of buildings, and industrial sheds. It emerges at dark, to feed on mice. It has a long-drawn kheeeeeee screech, which I have heard often in Chennai. Coming back from the bird cage, I nearly stepped on a slug (ew). Mom filled some boring forms, and then we walked around the place. It was leafy and serene. We saw a stable, where a really thin horse was eating some hay, and a couple of buffaloes were taking a nap. All the animals seemed to be recovering. I'm pretty glad I went to see this place. If you can't tell the Aranyakas from the Brahmanas, you might want to check out this brief introduction to Hindu religious literature. The Vedas are collections, of hymns, melodies, rituals and incantations. 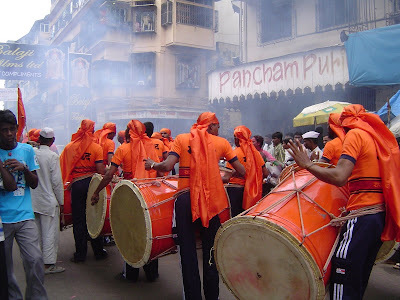 They are considered the primary texts of Hinduism. According to Klaus Kostermaier, a Canadian professor of religious studies, the beginnings of the Vedic ritual and textual tradition can be traced to 6000 BC in Northwest India. The Brahmanas are commentaries on the Vedas, explaining the rituals. These were composed in the Brahmanic period (900 BC to 500 BC). The Aranyakas - literally, forest treatises - are meant for sages living a life of renunciation. Unlike the Brahmanas, which deal with rituals, the Aranyakas deal with the philosophical aspects of the Vedas. The Aranyakas are also from the Brahmanic period. The Upanishads are mystical contemplations designed to teach the means of liberation from rebirth and suffering. Thus they are also called Vedanta - the end of the Vedas - since they teach the ultimate secret to reach the highest metaphysical state. The oldest of these dates from the Brahmanic period, but some of the recent Upanishads are from the medieval times. There are several Smritis, or Codes of Law, whose authority is based on the standing of the author. 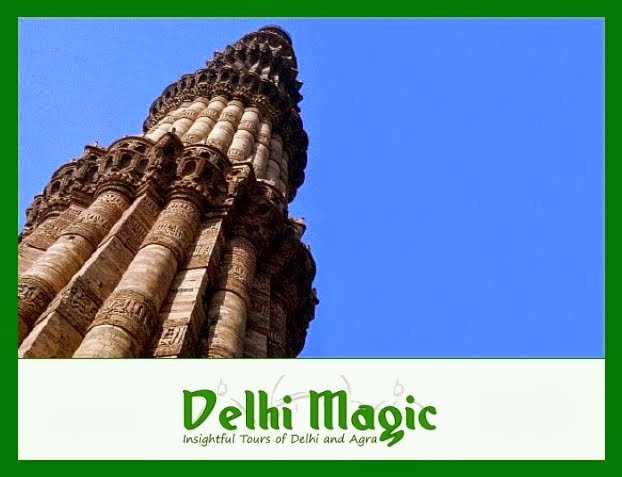 The most well known of these is the Manu Smriti, thought to date between 200 BC to 200 CE. The Itihasas - literally, 'histories' - are older than the Smritis. They include the great epics Ramayana and Mahabharata. The epics were composed between 500 BC to 100 BC. The Puranas are texts that provide information about the creation of the universe, the genealogies of kings, rules for life, and mythologies of various Gods and holy places. They are thought to date between the 300 CE and 1200 CE. While the classification of these scriptures is universally accepted, their historical dating is controversial. The major languages in which these scriptures appear are Sanskrit in the North, and Tamil in the South. Apart from these, Hindu literature also includes many other treatises - for example, the Sutras are shorter succint versions of Hindism's voluminous primary literature. The above literature is common to all Hindus. But some Hindu sects have their own sectarian writings - such as the Samhitas of the Vaishnavaites, the Agamas of the Saivaites, and the Tantras of the Saktas. Ok, so here I am, on a Jet Airways flight from Bangalore. They're still boarding, so I have a couple more minutes to type and save this.